Sliver or Black two front panel version available, so tell us your choice during the order, default we sent you an available version. DAC-03A's coaxial, SPFDI and BNC input are all support 24bit, 192K, but its decode chips are better than DAC-01A. 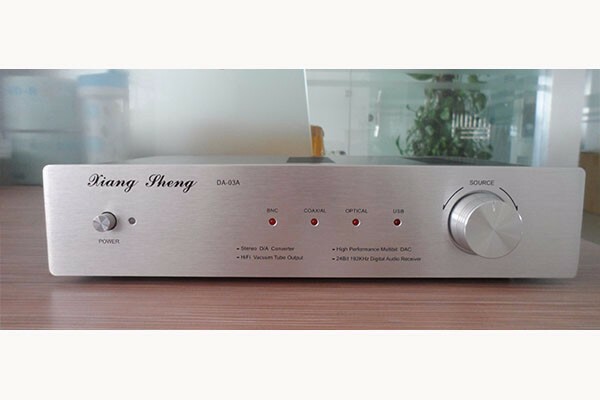 This DAC has two stereo RCA outputs : Normal op-amp output OR tube buffer output . it's convenient with tube amp or transistor amp, to get different effects . The main amplifier board with dual-panel design , production of fine . Tube output module use USA GE's GE5670 tube, the sound is mellow. High voltage and filament are regulated DC power supply. The machine resistors, capacitors do not use SMD components , but are of high quality discrete component assembly fever , so the sound quality can be guaranteed. The machine uses a lot of fever components: the US’s DALE and Japan‘s metal film resistors, Germany WIMA polypropylene capacitors, Suren capacitor , CBB subminiature metallized polypropylene capacitors, monolithic capacitors. Never use of polyester , tiles and other common components. Thus ensuring pure sound , high resolving power , small bass , a wide sound field and so on. 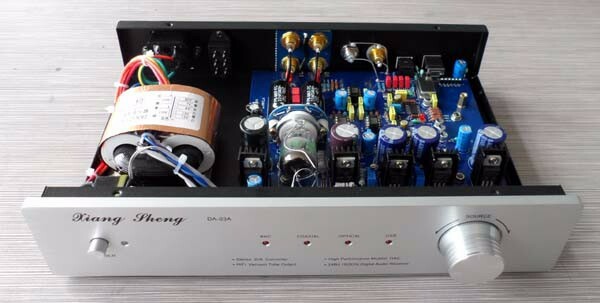 The use of the superior performance of R-type transformer power supply ( often used in high-level hifi equipment ) , although the cost ratio circular , square transformer greatly increased , but high efficiency, small magnetic leakage . RCA output and coaxial plug are gold-plated to reduce contact resistance.